Although we’ve had a fabulous fall, with hardly any snow and cold, Old Man Winter finally arrived all at once. 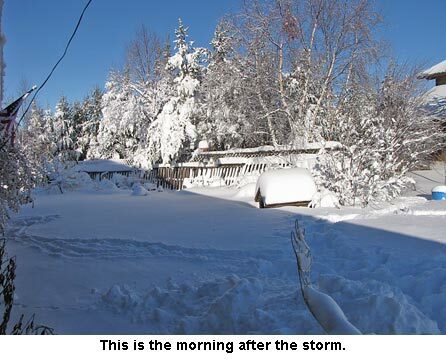 We were expecting 8-12 inches which the weather radio updated Thursday evening to 12-18 inches. Well, it began snowing and blowing, then REALLY snowing. We ended up with more than 24 inches of heavy, wet snow. Then it got cold. 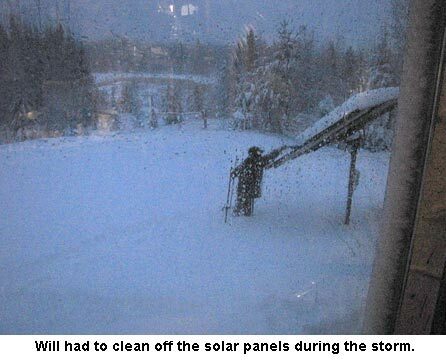 Will had to wade out through knee-deep snow in the evening to sweep off our solar panels so the heavy snow didn’t break down the rack as the wind was also pretty stout. It was very nearly a blizzard but the 40 mph wind came in gusts not steady winds as in a true blizzard. At any rate, we couldn’t even see the storage building from the house which is only about 50 feet away! Luckily, we’d spent two days picking up tools, hoses, firewood, etc. in preparation for the snow or we’d have been in a fix. Will also got our plow truck ready. He found out the smog pump was seized up, making the fan belt screech. He spent all day Thursday working on getting that fixed and didn’t have time to put on the plow. I guess we just keep working and that helps us stay at it. I know if I just sit for a day or two like when I get sick, my whole body doesn’t want to get back at it. We try to always be prepared but there’s always something we didn’t get done. Today I can’t find my pitchfork! I cleaned out the goat barn before the storm and am afraid I propped it up against the outside fence and the wind blew it over. I’m going to go shovel some more and see if I can find it as the chicken coop needs cleaning now. Mittens LOVES the snow. She pokes her head under then runs forward with her tail sticking right up. A mini-snowplow! But she doesn’t stay out as long once it gets cold and sits by the front door ready to come in when someone opens it. Wow, that was quite a snowy hit for you all. Glad you’re digging out and managing all of those many tasks/chores. Hope more sunshine comes your way! Wow! A person really has to know what they need to do when living in your climate. Being one of the “never gone through that” people I would be clueless Jackie. I spent my first 26 years on the central coast of California. Then moved to western Washington with little sunshine and lots of rain. You and Will continue to amaze me. All the past hard work has made you much younger than me. I so respect both of you. And at 65 years old, envious of your youthful life. I went shopping with hubby for Thanksgiving dinner yesterday. This morning my body feels like I cleared your driveway with a shovel. Would love to hear some thoughts about how you have remained so strong. As always thank you for sharing your lives with me. Wow-What a hit of snow! We only got about 2″ here in Littlefork, MN. Stay warm-it has been a weird winter here so far. Oh my goodness! What a lot all at once. Thank goodness for the weather folks who can let us know it is coming. What does little Mittens do with that snow? 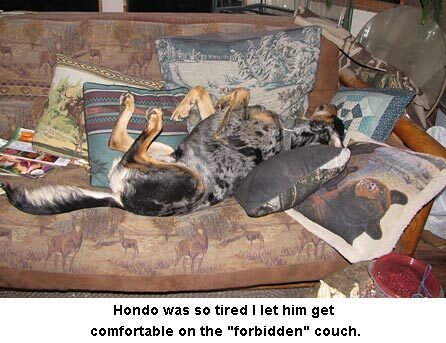 Hondo was one tired pup! Snow seems to be flying for so many. Central Illinois had such an extended Indian summer I haven’t even put away my flip flops yet! Glad you made it through well! Nice pictures of your snowy homestead. We are now getting the storm. It started yesterday and the wind has been really strong. I had to go out the back door this morning because there was a chest high drift in front of our front door. We got most of it cleaned up but it is still snowing and blowing. No relief until tomorrow morning. Glad to see the sunny pictures, something to look forward to. We usually don’t vet this kind of snow until well after Thanksgiving. I hope it’s not going to Be a wild winter. We kinda got spoiled last winter. 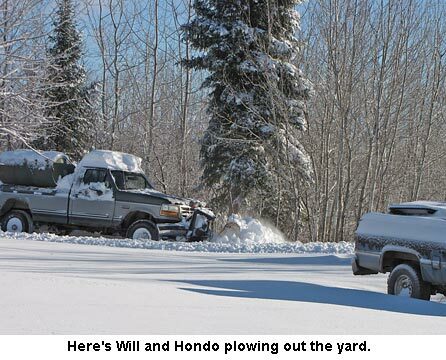 You, Will and Hondo stay warm and take it easy and have a Happy Thanksgiving. Lori from snowy Western New York.